Though, i think the most recent thing treated was a cormorant bite to the mouth some years ago, and maybe some blisters. If you go across the river, not down it, yes. Ingrid here was 62 in 2013. 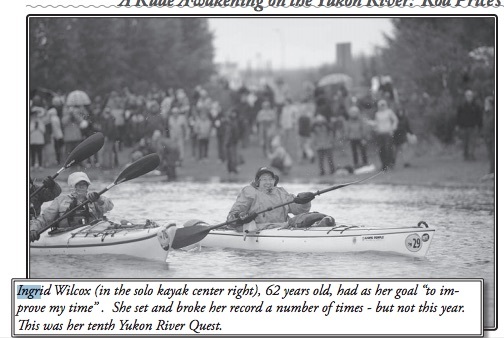 She was still competing in the race in 2016. its a 444 mile paddle, btw. You'll be fine if you be like Ingrid. I started paddling in my 30s. My partner completed the Yukon River Quest at 39. I'd have never done an award called "Start" nor "Ready To" - might have done the course but I'd have refused/torn-up any paperwork. The 'Trespass' advice document at the end of this page could make pretty interesting reading. Going in a car - should be fine. Going by train. Goodbye knife. Topic: Angling Trust & British Canoeing in Court Soon? Re: Angling Trust & British Canoeing in Court Soon? I think there is a longer section on the paddle in the book itself. The section about 45 to 60 quid is under the header of 'Winter car parking pass' innit? In this case has the sub-editor cut out too much?